The Dog Room is a collaboration between Pen (Australian-based product design brand) and Melbourne-based architect Michael Ong (MODO, Michael Ong Design Office). Michael Ong’s concept is inspired by the basic archetype of a house; complete with pitched roof, it’s a child’s typical line drawn representation of home. By exploring this childlike yet beautiful idea of a house, Michael Ong and Pen were able to create architecture for dogs that pursues simplicity and minimalism. 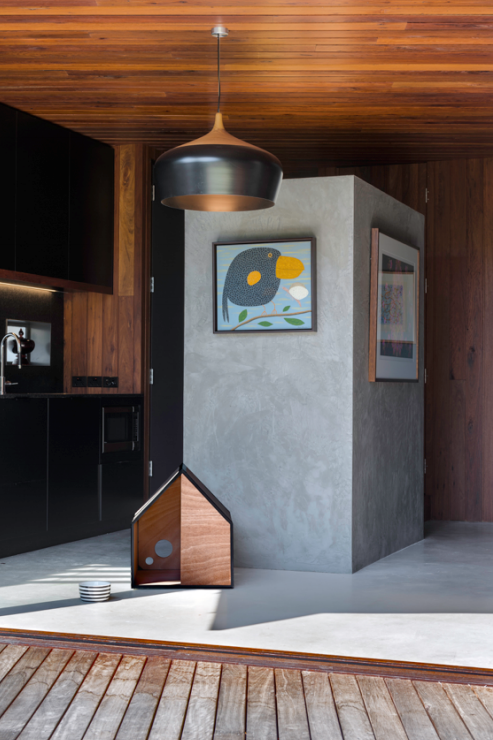 The Dog Room comprises a custom aluminium frame and series of plywood panels, which is carefully detailed to create a distinctly clean appearance. A door at the front and two holes for ventilation at the rear complete the design, making it suitable for either indoor or outdoor use. Waterproof-coated marine plywood is an unexpected material choice (especially since most kennels are made from plastic), but it’s one that embodies Pen’s Slow Movement philosophy and each panel can be easily replaced if damaged. The Dog Room is also designed with an OSB (Oriented Strand Board) option and is available in two sizes. Melbourne-based architect Michael Ong established MODO (Michael Ong Design Office) in 2011 and two years later he won the Architecture and Interior Design category of the Qantas Spirit of Youth Awards. 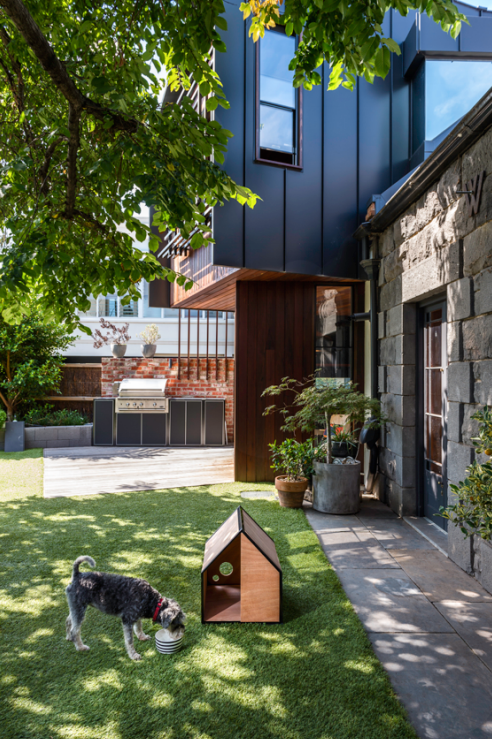 Michael’s Hans House was shortlisted for the (Australian) Houses Awards in 2013 and more recently, the Tunnel House was shortlisted for Houses Awards in 2016. Michael Ong’s residential projects have been widely published in both national and international magazines. The seed for Pen was first planted in 2013 in a small Copenhagen apartment en route to the Milan Furniture Fair. It all started when co-founders Michael Mabuti and Susan Chung were speaking with a furniture designer friend about opportunities for designers in Australia. That’s when they realised there needed to be more and back home in Melbourne, the husband and wife team set about establishing a brand to support and promote Australian designers, underpinned by a strong ‘design local’ ethos that embraces both on-shore and off-shore manufacturing opportunities. The resulting initiative involves collaborations with emerging and renowned Australian designers and brings innovative products to an international market. 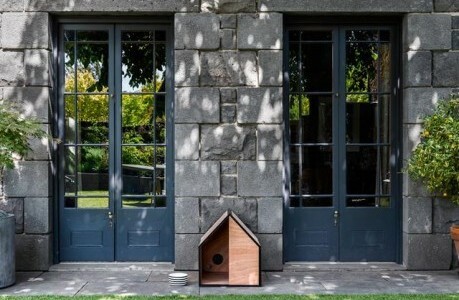 Pen’s first product is The Dog Room, designed in collaboration with architect and fellow Melburnian, Michael Ong. Pen’s ‘soon to be released’ next products are in collaborations with multi-awarded Australian designers Nick Rennie and Jim Hannon-Tan. Nick Rennie has designed products for Ligne Roset, Porro Italy and Normann Copenhagen. Jim Hannon-Tan, former design manager at Marcel Wanders and Tom Dixon, has designed products for Alessi and has collaborated with the likes of Artemide, B&B Italia and Magis. Are outdoor dog kennels still a thing, except as an exercise in irony? From a welfare point of view, it’s better to keep your dog inside, and for goodness’ sake, what’s the point of a companion animal you banish out of sight? Yes, it’s a nice design, but for an object for which there is no apparent necessity.